NBC’s ‘Grimm’ delivers intermittent thrills. In its first season, NBC’s dark fairy-tale cop procedural was often indecisive (and that’s putting it nicely), introducing new characters and plots without aim or direction and frequently dropping both without resolution. The show, about Portland detective Nick Burkhardt (David Giuntoli), who inherits the ability to see supernatural creatures called ‘Wesen’, lacked the bite it so desperately needed to be interesting. Watching Nick establish his role as a cop for both Wesen and humans was sometimes diverting but mostly frustrating. There were a few bright spots (the deliciously twisted “Organ Grinder,” serialized standout “Love Sick,” and exciting world-builder “Cat and Mouse”) but the show seemed to oscillate between expanding its universe and telling sometimes dull “monster-of-the-week” stories. This was never more evident than in the season’s finale, “Woman in Black,” which ended the season on a sour note with little resolution and blatantly telegraphed twists. I wanted to like Grimm, and so I stuck with it this season. I was pleasantly surprised by a lot of the episodes and, (finally) the show has progressed to the point where I can happily continue to watch it. The second season, though rocky and sometimes just plain dumb in places, is a vast improvement over the first. That’s not to say that Grimm is anywhere close to terrific. It’s certainly better than before, but then again that isn’t saying much. There are still overlong, boring character arcs and idiotic plot twists. And Bitsie Tulloch, as Nick’s laughably pathetic girlfriend Juliette, is somehow getting worse with every episode, now unable to convey a single convincing emotion. And the show made the mistake of saddling her with an overarching plot so redundant and boring that it deflated every episode it appeared in. But overall, Grimm has slowly improved, steadily building its universe and characters while figuring out what works and what doesn’t. I’m optimistic about its future, much more so this season than last. The best episodes of the season either expanded Grimm‘s Wesen world or told entertaining and intelligent standalone stories. In that first category, midseason finale “Season of the Hexenbiest,” the satisfying “Face Off,” and the two-part season finale (“The Waking Dead” and “Goodnight, Sweet Grimm”) come to mind. Without fail, as Nick learns more about the supernatural world he is a part of, the show gets better. 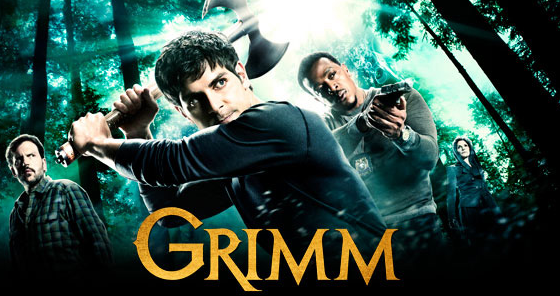 The serialized episodes give Grimm an opportunity to commit to its darkness, asking tough questions of Nick as his duties as a detective come into conflict with his responsibilities as a Grimm. His tense standoff with the Wesen royal families of Europe has yielded some intriguing episodes this season. On the procedural side, fun caper “One Angry Fuchsbau” and the gripping “Kiss of the Muse” show how entertaining Grimm can be when good performances and compelling plotlines converge. The show’s writers are mostly getting smarter, and the show has managed to establish a pace and tone that suit it well. I see promise in Grimm, which makes the bad episodes (too many to name) disappointing but bearable. The actors, excepting the hopeless Tulloch, are also improving. Giuntoli, who gave a wooden and unconvincing performance as Nick in the first season, is visibly becoming more comfortable carrying the series, and he follows through on the emotional scenes he was unable to deliver last season. The series’ MVP is still Silas Weir Mitchell as charismatic Blutbad (a werewolf Wesen) Monroe. His scenes, particularly with love interest Rosalie (the delightful Bree Turner), are both the best-acted and most consistently amusing in the series. In supporting roles, Sasha Roiz plays mysterious Wesen Police Captain Renard with a dangerous, cool energy that makes him compulsively watchable, while Claire Coffee, as wily Hexenbiest Adalind Schade is a beguiling villainess. This entry was posted in Reviews and tagged david giuntoli, drama, fairy tale, grimm, nbc, sasha roiz, silas weir mitchell, supernatural, tv show. Bookmark the permalink.